Many bromeliads are grown as attractive, tropical houseplants, and one variety, the pineapple, is grown for its fruit too. Pineapples need warm temperatures year-round, but gardeners in cooler climates can still grow pineapple by planting it in a 5-gallon container and bring the container indoors when the weather gets cold. You can divide bromeliads like pineapples by removing the "pups"—shoots or suckers from the base of the plant—and repotting them to grow a new pineapple plant. Locate the pups on your pineapple plant. The pups look like miniature pineapple trees growing at the base of the mother pineapple plant, and they usually sprout either just before or just after the mother plant flowers. Wait to divide a pineapple bromeliad plant until the pups are about one-third the height of the mother plant. Prepare a container for transplanting the pups. Depending on the size of the pups, a 6- or 12-inch-diameter pot is usually sufficient, since you can transfer each plant to its own larger pot as it grows. If you live in a tropical climate, you can grow pineapples outside and can plant the pups directly into the ground. 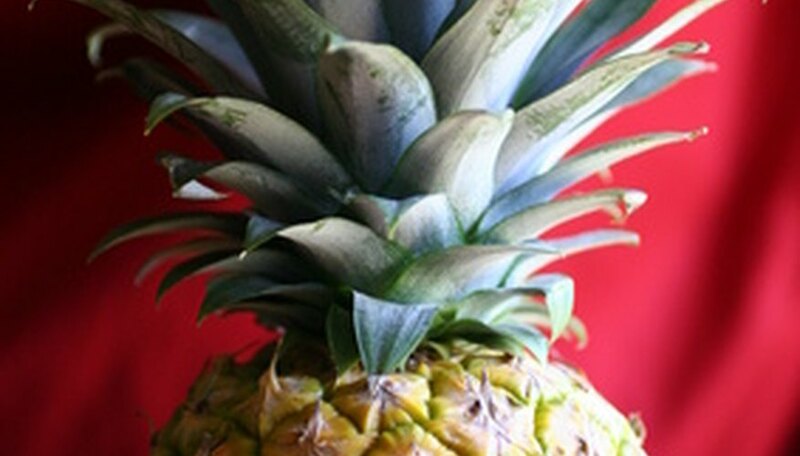 Pineapple plants like well-drained soil that is slightly acidic. If you'll be growing your pineapples in containers, look for a potting mix that designed for other acid-loving plants, like blueberries or rhododendrons. Use a sharp knife to slice the pineapple pups off of the mother plant. If there are any roots attached to the pups, be careful not to break or damage them. Don't worry if there are no visible roots; they'll form later. Transfer the pups into the previously prepared container, and bury them to approximately the same depth they were growing before. If the pups haven't formed any roots, you need to provide some kind of support to hold them upright. A stick, metal rod or piece of bamboo will work fine. Loosely attach the pups to the support with wire or string. Water the new pineapple plants well immediately after transplanting. Thereafter, keep the soil lightly moist. Keep the new pineapple plants out of direct sunlight for the first week to give them some time to recover from transplanting, and then slowly introduce them to brighter light. Like most bromeliads, pineapples like as much sun as they can get. Feed your pineapple plants with an all-purpose houseplant fertilizer once a month after the pups have established themselves and put out roots and fresh leaves. If kept healthy, a pineapple bromeliad plant may produce edible fruit two to three years after transplanting. LSU Ag Center: Grow Bromeliads From "Pups"